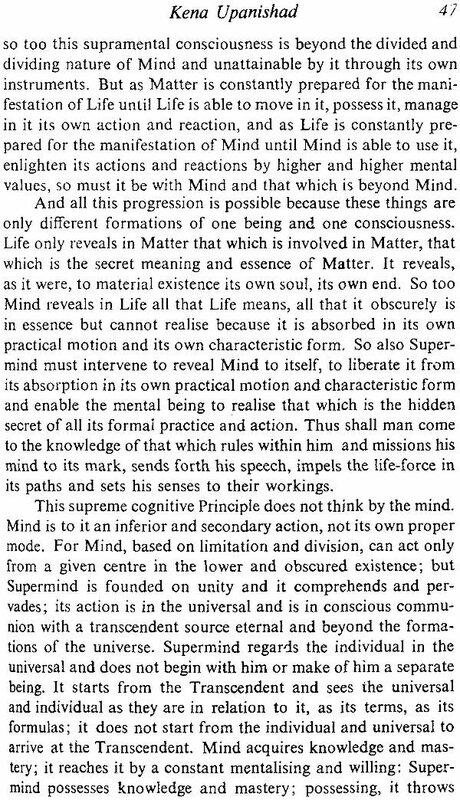 The world is for us what our mind and senses declare it to be; life is what our mentality determines that it shall become. 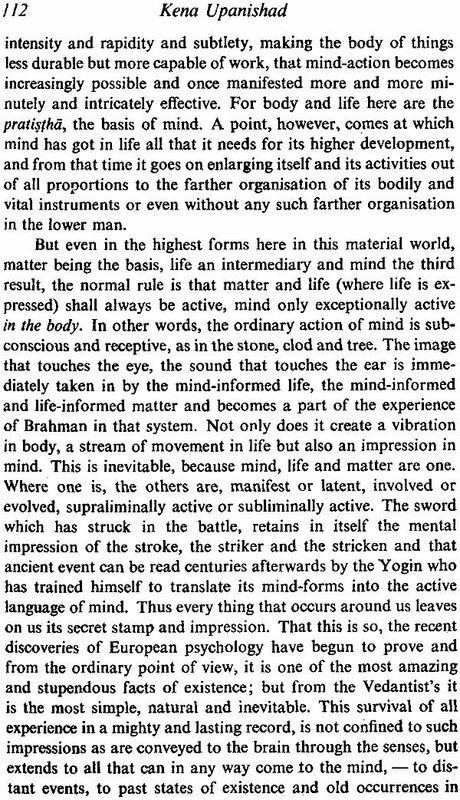 The question is asked by the Upanishad, what then are these mental instruments? what is this mental life which uses the external? Are they the last witnesses, the supreme and final power? 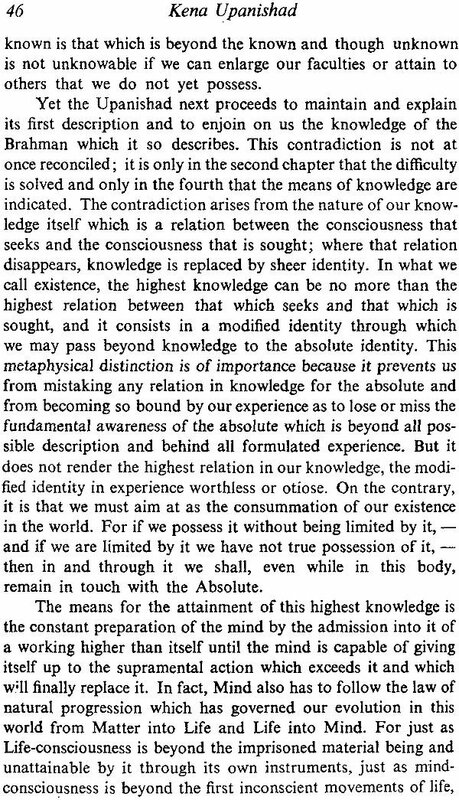 Is mind all or is this human existence only a veil of something greater, mightier, more remote and profound than itself? The Upanishad replies that there is such a greater existence behind, which is to the mind and its instruments, to the life-force and its workings what they are to the material world. Matter does not know Mind, Mind knows Matter. 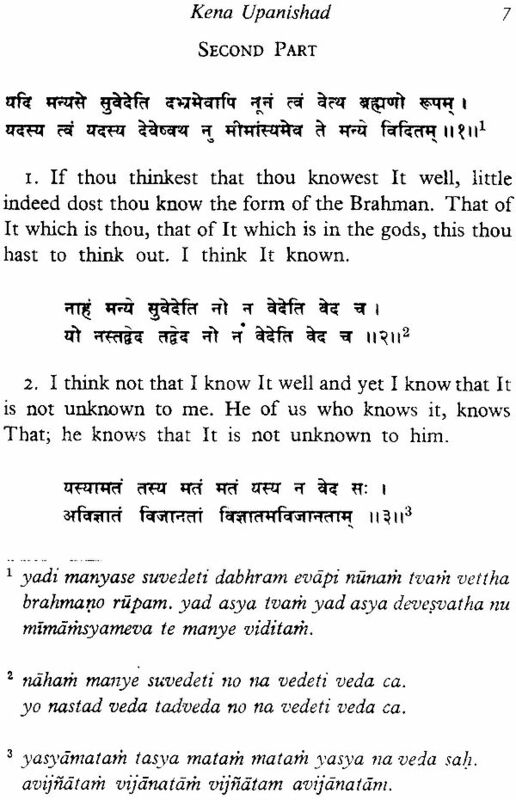 So also Mind does not know That which is behind it, That knows Mind. Sri Aurobindo, Yogi, poet, philosopher, social and political leader, was born in Calcutta on August 15, 1872. From age 7 to 21, he was educated in England, first at St. Paul's School, London and then at King's College, Cambridge. Returning to India in 1803, he spent 13 years in Baroda State Service as an administrator and professor, during which period he made a deep study of India's cultural heritage and political condition. In 1906, Sri Aurobindo went to Bengal and openly joined political activities; his journal, Bande Mataram, became the most powerful voice in India's early freedom movement. 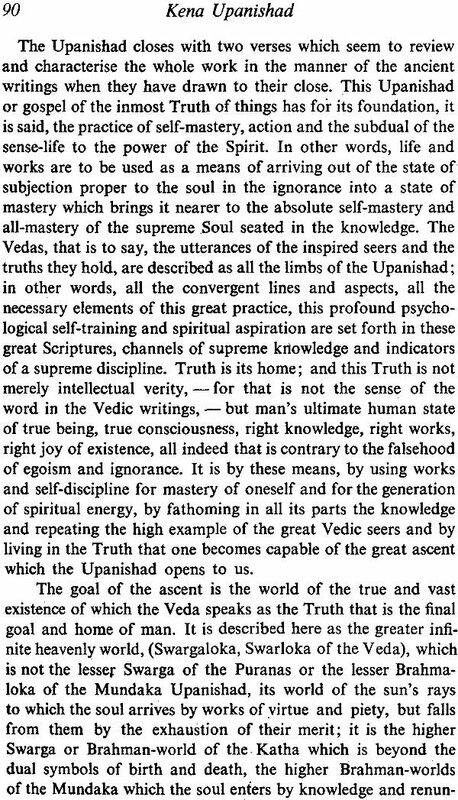 In 1910, retiring from active politics in order to devote himself exclusively to Yoga, Sri Aurobindo withdrew to Pondicherry, where he devoted his last forty years expounding through his voluminous writings the essential truths of the past traditional paths of spiritual attainment, not as an end in themselves, but as a preparation and a base for the advent of the next phase in terrestrial evolution beyond Mind-the Supramental Being-mapping out a more complete method, the "Purna Yoga" or Yoga of Integral perfection which aims at this spiritual realisation that would transform human nature and divinise earthly life. Sri Aurobindo translated a number of Upanishads, namely the Isha, Kena, Katha, Mundaka, Prashna and Mandukya, and wrote commentaries and articles on them at various times. 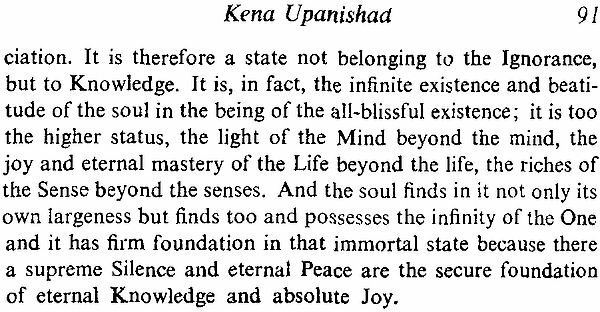 His translation of the Kena Upanishad first appeared in the Karmayogin in 1909. A revised version with commentary came out in the Arya in 1915-16. It was issued in book-form in 1952. The 1970 edition contained a further revised version which has been adopted in this volume. 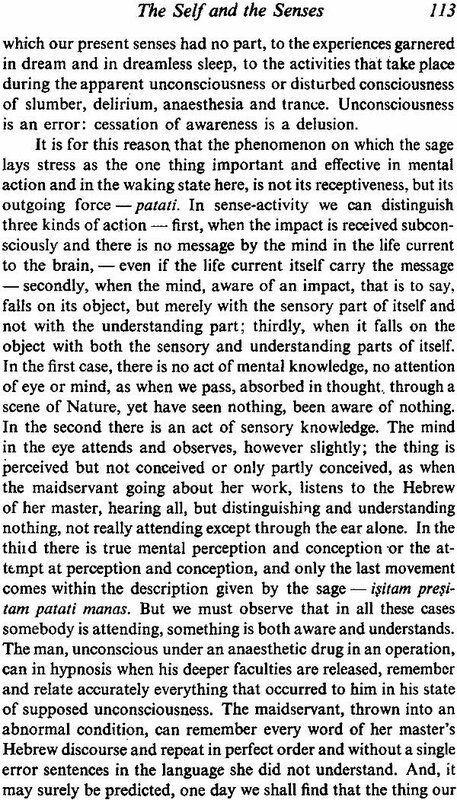 An incomplete commentary found in the manuscripts and published in Vol. 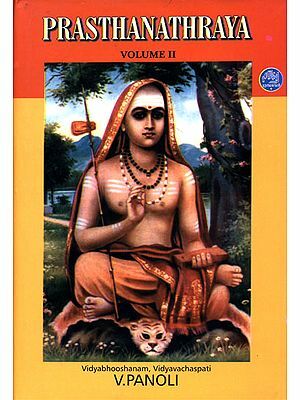 12 of the Sri Aurobindo Birth Centenary Library has been reproduced in this volume in the Appendix. 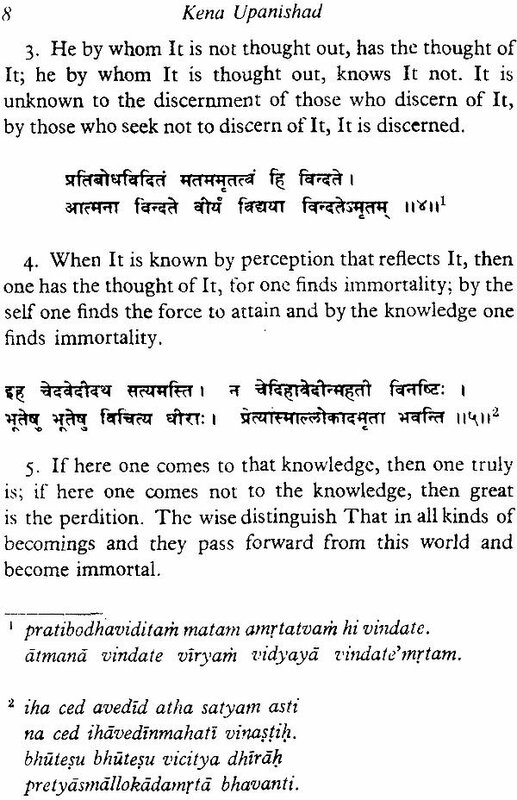 The Peace Recitation appears in the beginning and there is a glossary of Sanskrit terms at the end.